Hey! Hey! Friday, it's good to see you! First up, I want to say a huge THANK YOU again for all your calls, e-mails, texts, messages, and prayers the past two weeks for Britt. She's doing so much better. She's still on her liquid diet so she's a bit hangry at times (who wouldn't be?!). But she's doing so much better. We truly appreciate you all so much. You guys are my FAVORITE! I shared a little recap and update in a post earlier this week. Bowen Slaughter started Pre-K this week and is now going three days a week. He loves his teachers, has lots of friends in his new class, and had a great first week. Seeing this cutie love school is a new FAVORITE. He's always loved school, but I didn't know what he'd think about going three days...so far, so good! I'm telling you...it feels like just last year he was born! How did he get so big? A new FAVORITE shirt arrived in the mail. I'm always on the lookout for cute, comfy items that can be worn during errands, ballgames, and other mom activities but still allow me to look pulled together. This jersey shirt fits the bill. I'll keep you posted on how it washes and dries. And for those of you always on the lookout for good game-day gear this comes in navy/white, grey/white, and green/gold. Lots of options with those colors! Not bulky at all...had a cute fit. With Bowen at school three days a week, I've had a lot of one-on-one time with Miss Britt. One-on-one time with this girl is a FAVORITE. ;) #justthetwoofus On this day we drove to meet a friend who'd recently had a baby, the weather was amazing, and we took the babies on a walk. On Wednesday, I shared my love of a loafer. All my seventh grade dreams came true when I spotted this LEOPARD pair at the mall last week. FAVORITE! You can read all about my seventh grade loafer love in this post and see some cute leopard and fall tops as well. And with our new scarves we exchanged. I get asked a lot about this group of girls and I must tell you this group has been friends for almost ten years. If you're working on friendships, please don't be discouraged...friendships take time. I'm so very thankful for this group of ladies. I love them so very much. 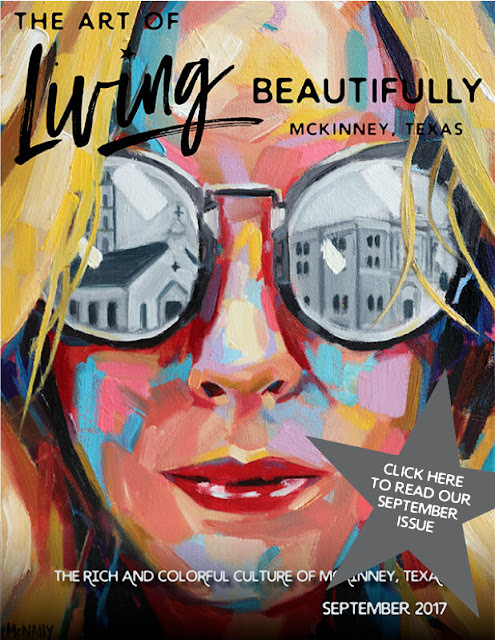 My friend, Lauren, just published her first edition of The Art of Living Beautifully, an online magazine all about our town, McKinney, Texas. Lauren asked me to contribute just a bit so I'd love for you to go check it out. You can find me over there. (Pay close attention to Page 4. :))I was so impressed with her skills. Lauren truly out did herself! The magazine looks GREAT! Definitely a FAVORITE this week! This past weekend was the first big weekend of college football. Tab was at the University of Oklahoma, which happens to be a short drive from us. He decided to take Nixon to tag along for the weekend and Nix had a BLAST! All the other officials were so sweet and made the weekend so much fun! They all played miniature golf and rode go-karts on Friday night. (It was a team building activity but happened to be RIGHT up Nixon's alley.) On Saturday, Mr. Dan helped out his kicking game. And then all of Nixon's seven-year-old dreams came true when he was catching passes in the end zone. A FAVORITE weekend was had by two of my boys. Tab has plans to take the other two on separate occasions to a game as well. They're all so excited about a weekend away with Dad and I'm excited to have one less person to feed all weekend. haha! So glad Britt is feeling better!! She seriously about broke my heart with that little muted cry the other night!! She is just the sweetest thing. And Bowen and that backpack....he looks so big!! Love him!! Happy Friday!! Linking back up for the first time in FOREVER and the very first Friday Favorites from my new blog! (I changed platforms and still learning Wordpress - YIKES) I can't wait to go back on all of your blogs and see what I've missed! Thanks for hosting today - I was so excited to see you were still doing the Friday link ups! Have a great day! I love this scarf exchange idea! How fun! I mean, BEST WEEKEND EVER for Nixon!!!!!! Britt was looking so cute in her denim jacket, and I'm so happy she's on the mend! That picture of you and Britt is so sweet!!!!! Oh my word! That girl loves her mama! Love having a big group of girl friends. Mine are separated in different cities but we always come together several times a year and it's just the best! So glad Britt is better. I missed the leopard loafers so off to read that now! Sounds like a fun Boys weekend away for sure! Oh, that picture of you and Britt together at the end just makes my heart so full! Also, I love that top on you!! Perfect for game day or running errands!! Happy Friday, friend! Cheers to have 3 in school now! Ha! Oh, and the pictures from OU remind me that I need to keep my eye out for my favorite ref - #thosearmstho Happy Friday, girl! Bowen can rock those bright colors! Totally fits his personality too! Oh no, you better send the boys down to Austin for a UT game too. You can't let them linger on OU (or at least this longhorn fan thinks so ... :) ). And by the way, thanks to your post about loafers this week I was "in the know" when my mom asked my opinion on a few different shoes yesterday. Loafers for the win! How fun for Nixon! What a fun thing for him and his Dad to do together. And I can't wait to check out that magazine. If the rest of it is as neat as the cover, I know I'll love it! Have a great weekend! Do you sell or donate your not worn clothes/shoes, etc? As often as you bring them in, I don't know how you don't run out of space! I'm in process of purging closets now & I love it! I'm getting rid of everything & not restocking! Minimalism is liberating! I bet your son loves going to the game with his dad! Such sweet moments! Does he lift every day? ?